She could be called poetry in motion... Excellent sailing photos of the rare M23. Nice to see such fine photos to add to the site. Sails Increase is owned by Chef Theo Petron. Chef Theo is in a couple of other albums on the Photo Site; The Northwest 2005 Cruise and the Bristol Channel Cutter album of Sentient. 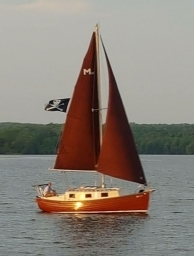 Sailing for Theo began with a Montgomery 17 back in 1993. The choice to go with a Montgomery was in part due to the salty appearance and gracious lines of the 17. As a new sailor Theo was inventive and determined and "just figured it out" . The forgiving nature of a shoal draft keel with centerboard was very helpful. Theo has been through alot with her. The keel housing became swollen and the iron punchings had to be swapped out with the newer design of lead balls for ballast. The repairs were done by Hoopers Yachts of Minnosota in the Spring of 2000. Theo didn't say the cost, just that it was lots. Another M23 "Dauntless" is having the same process done which will be covered in an album when she's been repaired.